Our work this month -and over much of this year- culminated in yesterday's field day with the chiefs and Group Village Headman (GVH) of the Mziza area. In the area, we have 23 chiefs (i.e. 23 distinct groups of houses, or villages, with a chief) over whom presides one GVH. The chiefs in one Group report to the GVH on development, judicial, and other civil issues. They work together to meet their goals as a group. The failure, or success, of one chief can have an impact on the whole group when government assistance is determined by collective performance. When we conceived of the Mziza Demo Garden, we had in mind a place that would attract farmers from a radius of about 25km. There are 3 GVHs in that area, the closest being GVH Mzindo. Today Mzindo and representatives from his 23 subchiefs met us at the demo garden. We toured the garden and described the different activities taking place. Some chiefs took the opportunity to try out two water pumps we had on display. We went over issues related to farm planning, and seeing our onions in 3 stages of growth drove home the idea of year-round production. In the end, the chiefs said they would each bring 5 farmers to learn more about irrigation at the Demo Garden. Some chiefs were even discussing what materials they could find to start making their own water pumps. To many, hunger seems an inevitable experience in the community. This year, rains did not fall according to the people’s expectations. Many areas received erratic rains. This situation has resulted in poor yields, bringing a threat to most of the households that have small scale agriculture lands in Malawi. According to our observations, very few households have managed to harvest crops that will carry them through the entire winter season up to the period of planting rain-fed crops. This is a major blow especially to children who will need nutritious foods, every day. However, AWP beneficiaries look at the problem stated above as an opportunity to show the community that there is a solution to the pending hunger. For instance, Mr Storo (one of the AWP beneficiaries in irrigation farming) has a different story to tell. He requested maize seeds from AWP sometime back. Having fears with the way the rains fell in the area. AWP took this request into consideration and provided maize and beans seeds to farmers to supplement food availability to AWP beneficiaries in Mziza village. 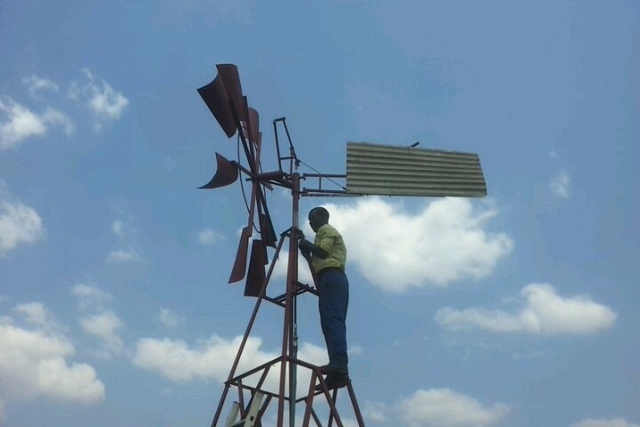 As for Mr Storo, he planted maize and beans on an irrigated garden where he uses a rope-and-washer pump developed by Africa Windmill Project. The picture you see above, is part of his garden where Mr Storo expects to get up to 5 bags (50kg each ) of maize that he will be able to feed his family up to the next rainy season. When hunger strikes, that is the time that people recognize the importance of irrigation farming (Winter cropping in Malawi). In Malawi, farmers who are direct beneficiaries of AWP irrigation technologies will tell successful stories due to the irrigation farming solution that AWP has made available for them. The contribution of irrigation farming in reducing hunger and poverty will be clear this year. As I’m writing, many farmers are seeking AWP irrigation systems that have proven to ease irrigation farming to potential small scale irrigation farmers in Malawi.